Nepal was hit by the worst rains in 15 years that started on 11 August 2017. It caused severe flooding in the Terai with huge impact on livelihood, food security and nutrition due to losses in lives, assets, housing, infrastructure including water and sanitation, food stocks and agriculture production. 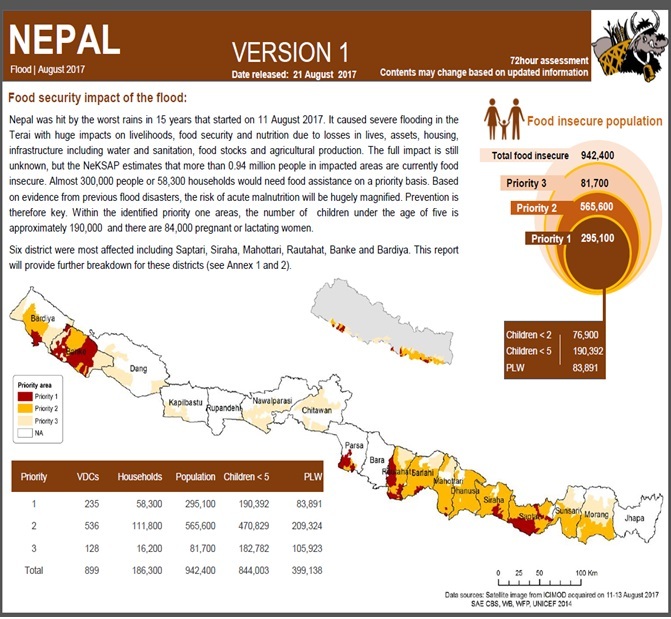 The full impact in still unknown, but the NeKSAP estimates that more than 0.94 million people in impacted areas are currently food insecure. Almost 300,000 people or 58,300 households would need food assistance on a priority basis. Based on evidence from previous flood disasters, the risk of acute malnutrition will be hugely magnified. Prevention is therefore key. Within the indentified priority one areas, the number of children under the age of five is approximately 190,000 and there are 84,000 pregnant or lactating women.